Weddings mean giving and getting presents, but if you already have enough stuff, and you want to make the world a better place, this page is for you. We originally created this page to provide our guests ideas for our alternatives to wedding gifts. Now that the wedding is over, we have decided to use this page as a resource to help other couples divert the generosity of their friends and family to make the world a better place. When we (Lucy and Dan) decided to get married, we began looking for an alternative to being overwhelmed with gifts from our guests. Sure, wedding gifts are useful if a couple is just getting started and really do need the household things that people tend to give at weddings. But we had both been living on our own for a decade, so if anything, we had too much stuff already! Guests at weddings seem to be naturally generous, so rather than just indicating "no gifts please," we thought it would be nice to redirect our guests' generosity toward something that would make us happy but not fill up our apartment to the rafters. And to us, that meant getting people involved in helping others. And so, we embarked upon the Grand Experiment which we share with you, our reader. We hope that others might find it a good idea and follow our suggestions (and tell us about it). "Change the world before someone else does it for you." Once you have decided that you would rather not get wedding gifts, you will of course need to do things a little differently than all the usual wedding guides tell you about gift-receiving. Your guests need to know what you are trying to accomplish, but you need to be subtle about it -- after all, common ettiquite dictates that you don't talk about gifts in your wedding invitations, since it would be presumptuous. People are never expected to give a gift. And since many people aren't familiar with local community organizations or what they could do, it would help to provide your guests with some suggestions. Essentially, this means 'registering' -- not for gifts at department stores, but for many kinds of involvements (donations, sign-ups, or material goods) with community organizations. We called up 3 local organizations (two of which we had already been involved with, one which we recently heard about and thought would be greatly appropriate for this) and needless to say, it came as quite a surprise to them that we were interested in registering with them! Once the shock wore off, they were all very creative in suggesting ways that our guests could get involved. Registering essentially requires that they understand that people may be contacting them to make a donation or involvement on behalf of your wedding. Such organizations generally keep track of who contributes, so it shouldn't be a problem if they are told that a contribution is made on somebody else's behalf. You may want to discuss with them how your friends can help out -- are there any particular needs (such as office equipment or materials) that could be donated? Do they accept volunteers or memberships? Cash contributions? There are often many ways that people can contribute. Once you've registered with some organizations, the trick is to get the word out about your desires. We slipped two separate papers in with our invitations (avoiding mentioning gifts on the invitation). One sheet was directions to the wedding; the other was a note. This is what it said; feel free to excerpt as desired. As we mark the beginning of our new life together, we hope it will be made even more special by your presence at our wedding. Of course, to mark a wedding day, many people like to give presents as well as their presence. But we would like to offer an alternative. Now that we have each other, we really do have everything we need. But there are many in the world that do not, and we hope that you would like to help us make the world a better place by directing any wedding-inspired generosity toward one of our favorite local charies/community organizations, with which we have "registered," or get involved as a donor or volunteer with the organization of your choice. 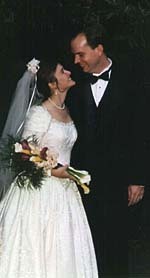 If you cruse the information super-duper, you can find out lots of details on our page at http://www.gigliwood.com/wedding/ -- or just chat with us for ideas. We also informed our immediate family members about what we were doing, since traditionally guests can find out where a couple is registered by checking with those close to the couple. Based on our own experience, this project was definitely a success. However, realize that no matter what, you will get gifts -- either from people who didn't pay attention to your subtle hints, or who can't stand the thought of not giving you a gift, or -- this was not forseen -- people who figure out how to make a community contribution which becomes a gift to you. (Examples: membership in Public TV, items purchased from a community arts council). Depending on how creative your friends are, you may find that not many actually took advantage of the organizations with which you registered. From our experience, actually very few people took advantage of the listings. It was fun to find out what people did choose; they generally gave us a card which mentioned what they had done. We're very happy we decided to modify the tradition of wedding gifts to help others. We hope that you, too, will consider this for your wedding if it's right for you! This page lists a few Bay Area non-profit, community organizations with which we have "registered" for our wedding. Yes, it's an unusual idea, but since we really have everything we need, we are hoping that you will take interest in diverting any wedding-inspired generosity to helping others. If you are inspired to help any of these, please mention when you contact them (or sign up) that you found out about them from "the wedding registry of Lucy Gigli and Dan Wood." That way, we and they will be able to know how great our friends are! Of course, these are just three among thousands of great organizations around the country that would benefit from your time or generosity. If you have a favorite community organization which you plan on helping, that's wonderful -- just be sure to let us know that you are helping another group, so we can properly thank you! Magik, inc. (Movement & Acquisition of Gifts In Kind) is an amazing organization based in San Francisco which collects all kinds of household and office items, and distributes them to 350 non-profit agencies around the Bay Area. They act as both an environmental organization, helping take unwanted goods from individuals and businesses, and a social service, helping nonprofits fill their needs. (See this article.) Need to clean out that closet or garage? You can donate furnishings, appliances, or just about any other goods that are in usable condition and that you no longer need, so that they can supply them to someone who does need them (and solve your disposal problem at the same time). CompuMentor matches up computer-savvy people (all around the USA) with community organizations in need of help with keeping up with computer technology. They are also the parent organization of a program which accepts and refurbishes old donated computers for distribution to San Francisco schoolchildren. (See this S.F. Chronicle article which describes Lucy's involvement with the program!) If you are computer-literate (word processing, desktop publishing, programming, installing, etc. -- Mac or PC), you can sign up (online is the easiest way) and indicate your interests, skills, free time, and so on. If they find an organization that could use your help, they will contact you. If you or your company have any old computers, you can donate them for redistribution. Community Impact is a non-profit volunteer organization in the San Francisco Bay Area dedicated to making community service easy and attractive by creating flexible and unique volunteer opportunites. They organize one day projects each week to provide a chance for busy people of all ages to contribute valuable time and energy to their communities, without the need for an on-going commitment. Community Impact has set up a wish-list so that you can help by donating equipment (or funds for purchasing equipment) such as paint and brushes for school-repainting projects, outdoor tools for nature restoration projects, etc.. Please contact them for suggestions. You can also try volunteering with C.I. for some upcoming events. You can contact them and sign up to request 3 complimentary newsletters, or you can join by sending in the annual membership fee of $15/person or $25/household. Naturally, your donations to these and any other registered nonprofit organizations are tax-deductible, but we hope that's not the only reason you're helping them out!